Saving for retirement is complicated, so it's not surprising that a few fundamental guidelines have become popular over the years to help simplify complex ideas. Here are four that you might have come across in reading, researching, or just talking with friends. Like most guidelines, they offer helpful starting points but need to be examined critically and adjusted for your specific situation. Save 10% of your pay for retirement. This is a good beginning, but many retirement experts suggest saving 15% of your salary. If you started late, you may need to save more. At the very least, save enough to receive any matching funds offered by your employer. Consider this: If you save just 6% of your salary and your employer offers a full 6% match, you are already saving 12%! The percentage of stock in your portfolio should equal 100 minus your age. 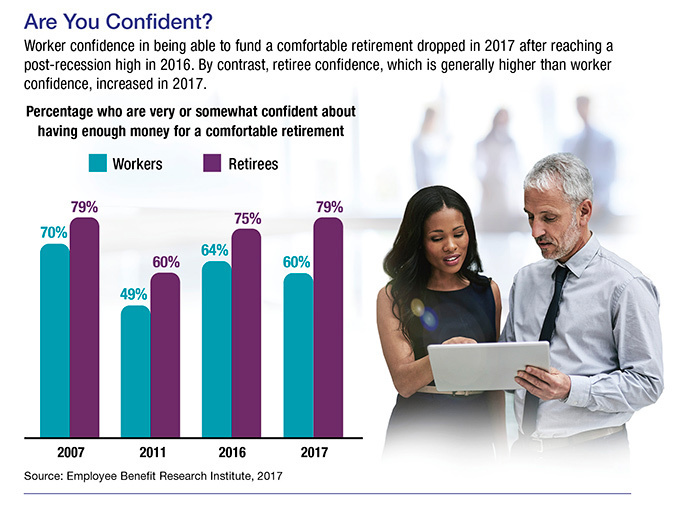 This reflects a fundamental idea that younger people can take on more investment risk for potential gain, while older people approaching retirement should protect their principal by converting some volatile growth-oriented stock investments to more stable fixed-income securities. Although the strategy is sound, the math may no longer be appropriate considering long life spans and low yields on fixed-income investments. For example, if you followed this rule at age 40, 60% (100 minus 40) of your portfolio would consist of stock, and at age 60, the percentage of stock would be 40%. Depending upon your situation and risk tolerance, you may require a higher percentage of stock at either of these ages to meet your retirement savings goals. You need 70% of your pre-retirement income during retirement. This is an older guideline — 80% is now more commonly suggested. But, in fact, there is no magic number, and you may be better off focusing on your actual expenses today and thinking about whether they'll stay the same, increase, decrease, or even disappear by the time you retire. While some expenses might disappear, like a mortgage or costs for transportation to and from work, new expenses may arise, such as travel, help with home maintenance, and increased medical costs. A typical 65-year-old couple who retired in 2017 might spend $275,000 on medical care in retirement, even with Medicare.1 Calculate how much you may need to pay your retirement expenses and add a cushion for unexpected events. A "safe" withdrawal rate is 4%. The "4% rule" suggests that you make annual withdrawals from your retirement savings equal to 4% of the total when you retire, with annual adjustments for inflation. This model was developed in the 1990s for a 30-year retirement with a portfolio that included 50% large-cap stocks.2 Although this may be a helpful guideline, some experts suggest a lower rate, and there are many other withdrawal models. Factors to consider include the value of your savings, the amount of income you anticipate needing, your life expectancy, the rate of return you expect from your investments, inflation, taxes, and whether you're single or married. Asset allocation is a method used to help manage investment risk; it does not guarantee a profit or protect against investment loss. The return and principal value of stocks fluctuate with changes in market conditions. Shares, when sold, may be worth more or less than their original cost. Wells Fargo Advisors does not render legal, accounting, or tax advice. Please consult your tax or legal advisors before taking any action that may have tax consequences. Wells Fargo Advisors did not assist in the preparation of this material, and its accuracy and completeness are not guaranteed. This information is intended for use only by residents of (AL, AZ, CA, CT, DC, FL, GA, HI, ID, IL, IN, KY, MA, MD, ME, MI, MN, MO, NC, NH, NJ, NV, NY, OH, OR, PA, RI, SC, TX, VA, WA). Please consult with each individual Financial Advisor listed on this site to understand what states they are licensed to transact business. Products and services listed may not be available, or may have restrictions, depending on client country of residence. ©2019 Wells Fargo Advisors Financial Network, LLC. All rights reserved.